The steps below will explain how to view users in a group. This can be epecially useful for students to check who else is in a randomly created group with them. 1. Go to moodle3.lsu.edu (if you are not already logged in to your PAWS ID, the Moodle Web site will require you to log in). 2. 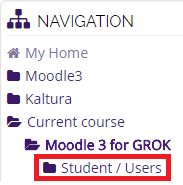 In the Navigation Block, click on "Students/Users"